Once again May and June have been great reading months for me. I feel like I’ve finally organised myself enough to carve out some time each day for reading. Whether it’s during my commute on a Monday morning, in the garden on a Sunday afternoon, or curled up on the sofa with a cup of coffee in the early morning. Since my last update I’ve read a total of 13 books so I’m going to jump straight into telling you all about each one. After all this post is going to be super long without my rambling on at this point! This is a London based mystery where siblings Ted and Kat investigate the disappearance of their cousin Salim from a pod on The London Eye. The pair make their way around London following clues on the hunt for Salim. I utterly adored this book, it’s an excellent mystery story with a clever plot and wonderful characters. I can’t believe it’s taken me so long to read it. But I was very impressed with myself for solving the mystery. And then I remembered that I was reading a book aimed at children! Two people mentioned this book to me in a matter of days, so I treated myself to a copy with my Waterstones vouchers. Luckily for all those involved this one is definitely worth the hype. The story follows Evan Smoak, a man trained as part of a secret government programme to be the perfect weapon. Before the book starts Evan breaks from the programme and turns himself into the Nowhere Man, helping those who have nowhere else to turn. And this is where the story starts for us, as Evan helps people with no other option. It is a gripping adventure filled thriller of a book, so just my sort of read. It’s also full of surprising and interesting characters, and I can’t wait to learn more about everyone in the series. This one is gripping from the start and just begs you to continue reading well into the night. So if you’re a fan of thrillers then this is definitely one for you. This book was on offer on the Kindle store and I wanted a change from the mystery and thriller genre, so it was the perfect pick. Although thinking about it there is still a mystery aspect involved – so clearly I can’t get away from that! We follow the main protagonist, Lane Roanoke as she returns to her grandparents house to investigate her cousin’s disappearance. Alongside her investigations into Allegra’s whereabouts we also flick back to a 15 year old Lane as she arrives at the family farm for the first time, to live with her grandparents and cousin. So the book weaves through both time periods. We discover the history of the house, and the stories behind the women of the Roanoke family whilst trying to solve the mystery behind Allegra’s disappearance. It’s very dark and disturbing, but it’s well written, if a little obvious in places. So I’m writing this post a good few weeks after I read this book and I can’t really remember anything about it. This is a story about a daughter and her mother and their difficult relationship. I started this on a whim and only finished it because it was short and I hate to leave anything unfinished. Saying that I’ve heard so many others sing the praises of this book, so perhaps I just didn’t get it. Whatever it is! This sort of thing happens to me a lot – oh well, I can deal with that! Now this book? This one I LOVED reading. Set in 1939 we follow Lily Shepherd, a young girl leaving behind her troubles and embarking on a voyage to a new adventure, and housekeeping job, in Australia. As the ship leaves port the UK is on the precipice of war, which brings another level of complexity to the interactions between all of the passengers. And that’s what I loved most about the books, the wonderful characters and their relationships with each other. The murder and crime part is almost secondary to all of that. In fact when the book ended I really wanted to turn the page and carry on reading. I wanted to know what happened next for all of the characters that I had become invested in. I’m slowly re-reading this series for about the nineteenth time. It’s a classic and still one of my favourites. It’s been a good couple of years since I read Goblet of Fire. And yet picking it up and cracking the spine felt like greeting an old friend. Books are magical in that way, aren’t they. The Hate U Give might just become my favourite book of the year. The book explores the issue of race in America and to me it feels like a must read for everyone. Starr is the only witness to the shooting of an unarmed black boy – her friend Khalil – by the police. The characters are well-written, fully formed and interesting and the story is so important. If you read just one book mentioned in this post then read this one. I’ve mentioned before that I actually gave up on this one because I wasn’t feeling it. But luckily for me I persevered and continued reading. While it took me a little bit of time to get into the book, it was totally worth it in the end. I guess technically it’s a sci-fi book but it’s more than that. It’s got a really clever concept, girls suddenly (and literally) hold The Power in their hands. The Power is the ability to manipulate electric currents and send electric shocks to others. The book follows four different characters as they adapt to this power and the changes that it brings to the whole world. The Memory Man follows Amos Decker a former professional football player turned police detective who remembers everything perfectly. We join Decker on the hunt for the killer of his wife and child. David Baldacci is one of my go to authors when I want a good story with intrigue and drama, and a sprinkle of unbelievably to it. Because let’s be honest sometimes we want to suspend reality a little. So if you can handle that, then this is a perfectly good read. It’s the first book in the Amos Decker series and I’m intrigued enough by these characters to continue reading the rest. It took me awhile to get into this one, but once I did I speed through it super-fast. Writer Nora is invited to a cottage in the woods for the hen weekend of an old school friend. Early on we discover that the pair haven’t spoken in years, so there’s clearly a story to tell. What follows is a dark and twisted tale of friendship and jealousy, secrets and lies, which leads to an explosive ending. I’m definitely planning on tracking down other Ruth Ware books to dive into. This is a collection of essays from black, Asian and minority ethnic voices exploring immigration in Britain and I think it’s a must read for everyone. It’s hard to pick a favourite essay in this book as they are all eye-opening and thought provoking in my opinion. I will say that I especially enjoyed reading playright Inua Ellams’ essay Cutting Through. In it he discusses the research he took when writing his latest play, The Barber Shop Chronicles. I actually saw this last month at The National Theatre and absolutely loved it (as mentioned here). I’ve not experienced theatre like it before, I could have watched it for hours. This is a follow on from The London Eye Mystery mentioned at the start of this list. Sadly Siobhan Dowd dies before she was able to write the second book, but she left behind the book title. Luckily the ever talented Robin Stevens took up the mantle and wrote The Guggenheim Mystery. It’s another wonderful read and I personally think it’s a perfect follow on from book one. Ted and Kat are now in New York City and are trying to find a stolen painting. Reading this made me wonder why I have never visited the Guggenheim Museum on my visits to this city. Something that I have to rectify on my next trip. Book four in the Throne of Glass series is everything you would expect. It’s got complicated characters, a twisting story and the most detailed setting I’ve ever read. The way this story is going is so intriguing, I would never have guessed that the story would reach this point when I started reading book one a year or two ago. If you’ve yet to discover this series then I’d highly recommend you give it ago. So there we have it, all 13 books that I’ve read in the last two months. 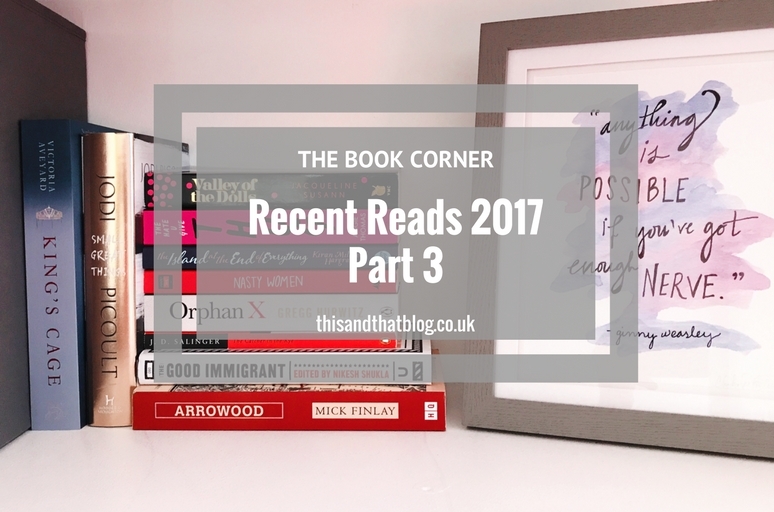 To see what else I’ve read in 2017 hop on over to parts one and two, or see the full list over at GoodReads here. Do you have any recommendations to share with me? What have you been reading lately and what should I try next.